Updated 3-19-19. Whether you market your mobile Notary or Signing Agent services through a website, Facebook or online directories such as SigningAgent.com, each week there are companies looking for profiles of mobile Notaries who fit their needs. And when they see your profile photo, it speaks volumes about you. A good photo could be all it takes to set you apart from the competition. After all, pictures are worth 1,000 words. While going to a professional photographer is best, if you’re trying to keep your expenses at a minimum, these five tips will help you take a great do-it-yourself headshot. Don’t mistake DIY for taking a “selfie” though. You’ll need to have a friend, family member or colleague behind the camera. Head to your closet and find the professional outfit you feel the most comfortable and confident wearing. Being in comfortable attire will help you relax in front of the camera. Try to avoid white shirts, busy patterns or large stripes because they can be distracting and the focus of the photo should be your face. Keep it simple, natural and tidy. Professional headshots aren’t supposed to be glamorous, so ladies, leave the shimmery eye shadow and bold lipstick on the counter. Gentlemen, this one is important for you, too. Go to the makeup aisle at the store and look for translucent face powder. Whatever the lighting situation may be, our faces and ears all get a little shiny and the powder will help you look calm, cool and collected. Again, keep it simple. Whether it’s a watch, bracelet, necklace, earrings or another accessory, choose something very small that won’t look dated in a few years. Another thing to keep in mind is that jewelry will catch and reflect light, so make sure you find the right lighting or choose a different accessory. Smile like the successful, professional public servant that you are. You’re comfortably dressed for success, and your facial expression should be an extension of your confidence. A professional, executive style headshot is generally a close-up from the shoulders up, but some people prefer cropping the photo from the elbows up. Try cropping your photo in a few different sizes to figure out which one you prefer and which one looks best online. Most smartphones and tablets have cameras with high-resolution options and cropping tools to make it easy. If you’re using a digital camera or other device without editing tools, there are a lot of free tools online like Pixlr​ that will help you make these simple edits. Now that you have a photo that represents you well, update your profile on SigningAgent.com. Please let us know in the comments if you start getting more work in the coming weeks. Gentlemen, before heading to the makeup aisle looking for translucent powder, try SHAVING instead. 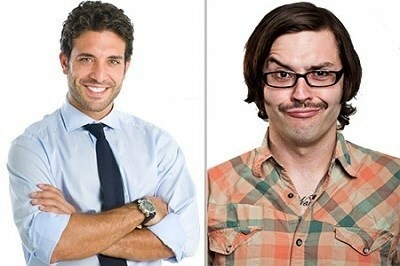 You'll look more professional than that guy in the "good" profile photo with his hipster stubble.